Johanna (aka Jo Jo) was born on February 27th, 2008, at 3:15 pm, three and a half weeks early and a whopping eight pounds, two ounces. Her parents, Hallie and Jamie Sklar, were told Jo Jo had Down Syndrome an hour after her birth, and within 24 hours she was transferred to Columbia Presbyterian Hospital in New York City for intestinal surgery. It was a scary time for Jo Jo's parents, as they had never expected to have a child with a disability, and were not sure they could handle it. But within a few days, they came to terms with the fact that Jo Jo had Down Syndrome--and fell in love with her. 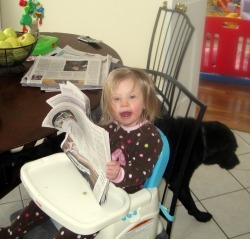 (Hallie, a magazine writer, ultimately wrote about Jo Jo's birth for the October 2008 issue of Baby Talk--you can find it on line at http://www.parenting.com/article/Baby/Health/Raising-a-Baby-with-Down-Syndrome.) Today, Jo Jo is an active, feisty two year old who loves books, dogs, Elmo, swings, throwing avocado and other random foods at her mother, and tormenting her eight month old baby brother, Theodore Wolf Sklar (aka Teddy). Her parents adore her beyond reason, although they readily admit there were a few road bumps along the way. Hallie suffered terrible post partum depression the first six months of Jo Jo's life, but was scared to tell anyone because she thought people would assume she didn't love her daughter. She finally got help and after a few months of antidepressants and therapy got her life back on track. Now, the Sklars are a busy family of four (five if you count the dog) who live in North Stamford. Jamie is currently in house counsel at a hedge fund while Hallie writes part time for various women's and parenting magazines such as Self, Parents, In Style and Glamour, and has become an active volunteer for Jo Jo's Birth to Three provider, Abilis. Jo Jo's days are filled with Birth to Three therapies, music classes, swim classes, gym classes, trips to the mall and the park, play groups, and bossing around her collection of Corollee dolls, but she always has time at the end of the day to sing "Puff the Magic Dragon" and cuddle with her momma. While Jo Jo currently has a bevy of male admirers, her parents are always looking for a nice Jewish boy with Down Syndrome if anyone knows of one. Her mom, Hallie, is more than happy to offer support to any new or expectant parents out there. You can email her at hzlevine@aol.com.